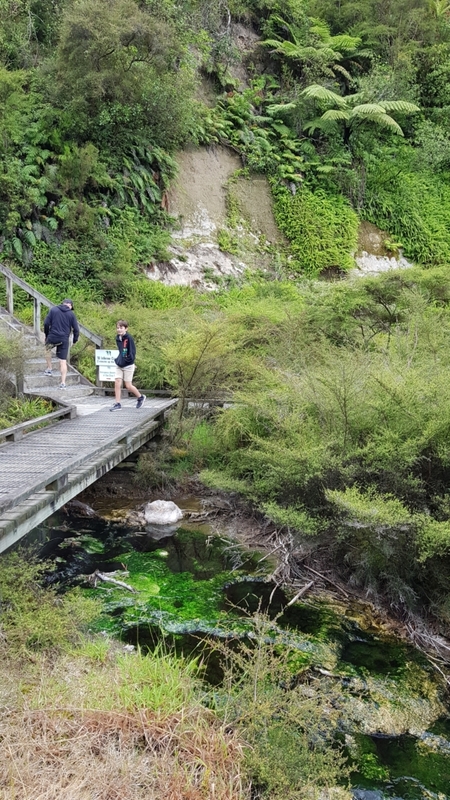 One of the (many) neat things about living in Rotorua is the opportunity to experience all the activities folk from all over the world come here to check out. 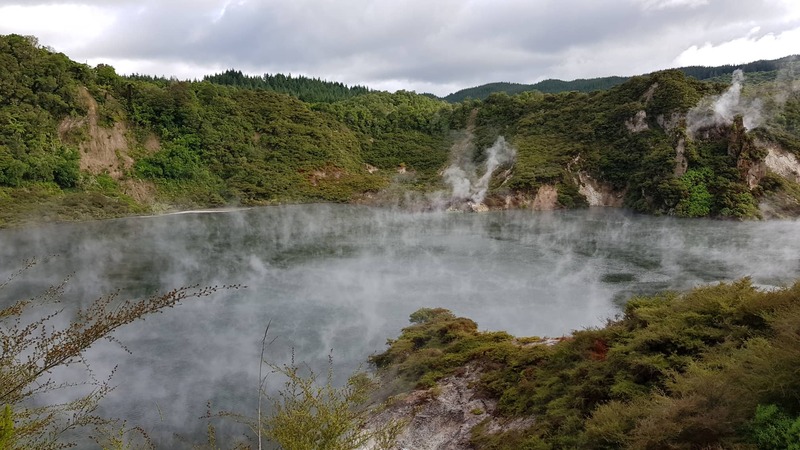 There is, simply, so much that is a Rotorua Must See. 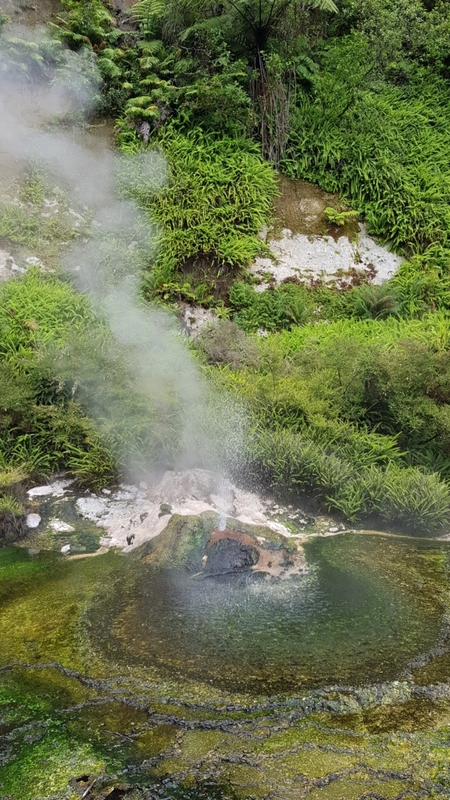 Thanks to a special family outing on my birthday late last year, my local’s ‘Must See in Rotorua’ list, now includes Waimangu Volcanic Valley. 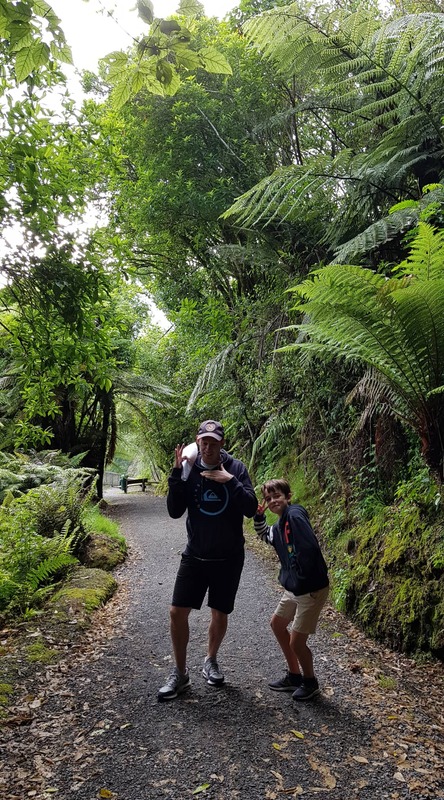 Just before Christmas, on my birthday to be precise, we took a family trip to Waimangu Volcanic Valley. In case you didn’t know, Waimangu Volcanic Valley has the youngest volcanic system in the world. 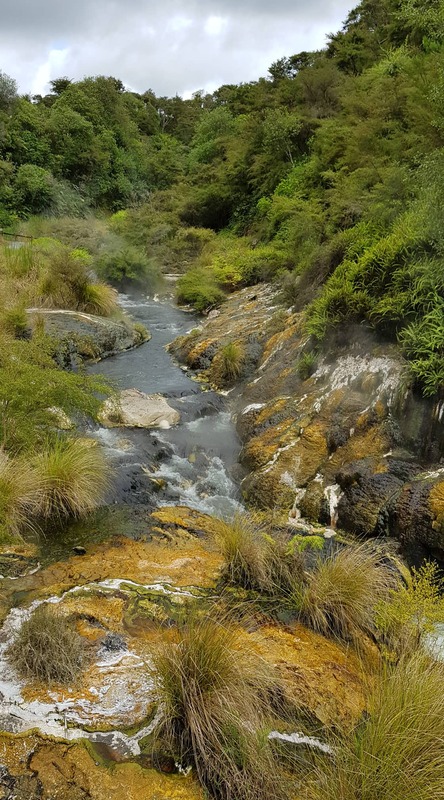 This volcanic system was formed after the eruption of Mount Tarawera in 1886. I’m a bit ‘late’ in writing this blog post, but I’m conscious the school holidays is nearly upon us, so I’ve pulled my blogging finger out! So, if you’re looking for something to delight the family – look no further! Bonus too, there’s a specifically guided tour over the April school holidays for families and little volcanologists. I’m tempted to make another trip there! Read on for details. Waimangu Volcanic Valley is both fascinating and incredible. Now I’m a tricky geothermal customer to impress as I’m lucky enough to see geothermal wonders most days at work (! ), but, trust me: Waimangu Volcanic Valley is SPECIAL. With seriously farty mud pools, erupting mini geysers, steaming lakes, flora and fauna and even a boat ride there’s so much to see and do. 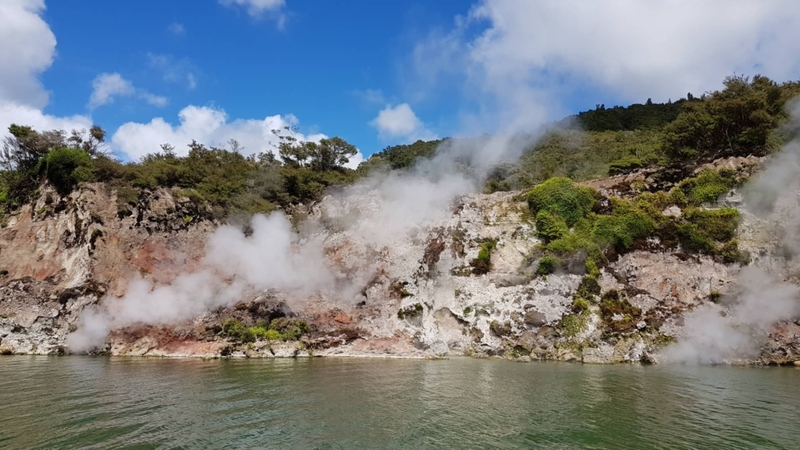 It’s on this boat cruise around Lake Rotomahana that you will see the site of the former world renowned Pink and White Terraces, which, in case you didn’t know, used to be known as the ‘Eighth Wonder of the World’. Got energetic toddlers? Let them run, there’s loads of the walking track that’s safe for kiddies to run ahead and burn off some steam, without fear they are going to accidentally stumble into a hot pool (there’s some parts though where you’ll want to get them back into the buggy). Got school kids? I’ve got one. 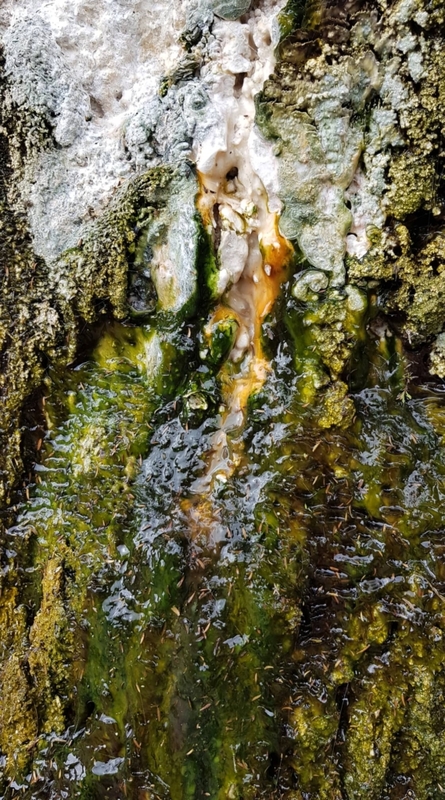 He nerded out at the science: Volcanic craters, enormous hot water springs, the brilliantly coloured micro biology, not mention the different birds. On the day we went the Inferno Crater was a vibrant and dazzling blue. We stopped and marvelled at this for a good quarter of an hour. My forestry loving hubby on the other hand enjoyed the fauna. Older folk like Nana will buzz out at the whole thing, I speak from experience as we got chatting to some 70 year old visitors from the UK who were positively fizzing at the whole experience (I do agree that Waimangu is a bit different to Wolverhampton…). Me? 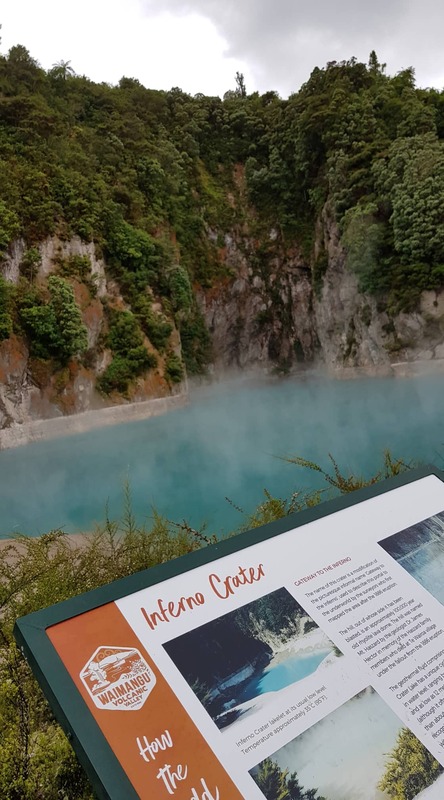 I loved seeing the site of the Pink & White Terraces and learning more about the eruption of Mount Tarawera. History enriching lessons aside, I was also blown away by the colours and the dramatic landscape. So much so, I snapped so many photos I had to delete some old and unwanted images to make some space on my phone! 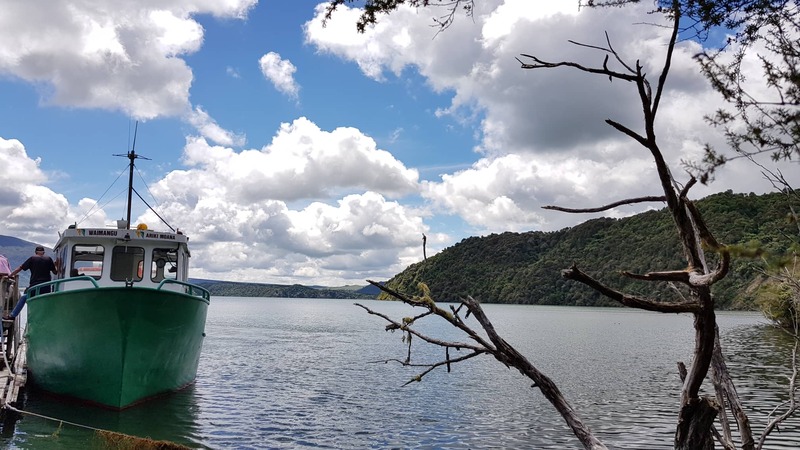 We spent a leisurely half day meandering on the well marked walking track (1.5 hour walk, mostly downhill) to Lake Rotomahana and chilling on the boat cruise. By the way, for those not keen to walk back uphill to the entrance: No worries: There’s a bus! Would be school holiday goers, get in: There’s extra cool stuff happening in the holidays. Tours run daily through the holidays: 13 to 28 April 2019. Their extra-special school holiday tours are free with general admission. Tours take one hour, then skedaddle around the valley at your own pace. Alternatively you can join the 2.50pm boat cruise on Lake Rotomahana. We didn’t book before we went, but apparently that’s recommended. It’s easy to book on their website (I tested it – click the dirty big ‘book now’ button!). But wait… Check out these COLOURS. Download theWaimangu app ahead of your trip for a augmented and interactive reality experience. On the day, you can hold the phone over various places to see what the terrain looked like prior to the eruption. Amazing! The captain on the boat came around with an iPad, mid cruise, and did a demo. There was lots of oohing and aahing. Good walking shoes, water, sunscreen and an empty bladder are a must. Loo wise, there’s only one towards the end of the walk. Make sure you have loads of room on your phone to take photos…! Allow at least four hours for the whole experience. Waimangu represents good value for family buck and, trust me, their prices are on the ‘lower side’ of prices for a family day out in Rotorua. Child: (under 5) – Free! Family Pass: Which is for two adults and up to three kids – $96.00. Like the sound of this? Don’t hesitate – you’ll love it. 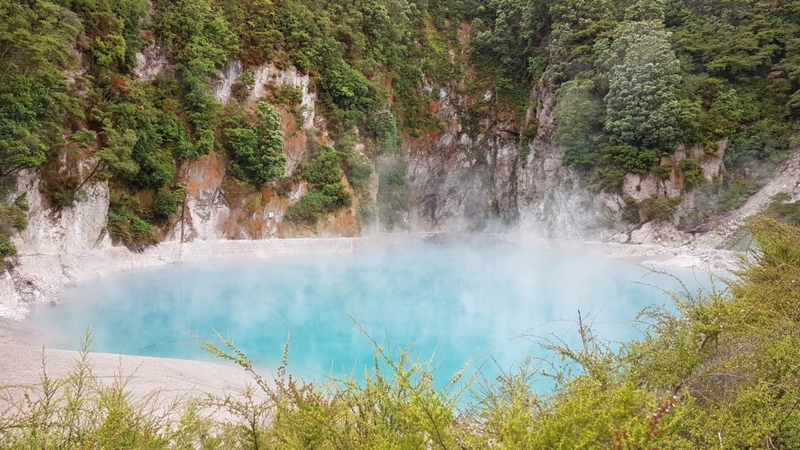 If you are looking for more to see and do in and around Rotorua, check out this blog post, otherwise my Instagram feed has lots of inspiration! Looking for accommodation? Aura Accommodation is my pick! Looking for a family lunch spot? My answer never changes: Ciabatta Bakery. Ka kite kōrua! Have fun in my beautiful city.